Check out this NPR story about the legacy of Tupac and then join in tomorrow's Maricopa Community Colleges Honors Forum discussion at Phoenix College with author Kevin Powell. 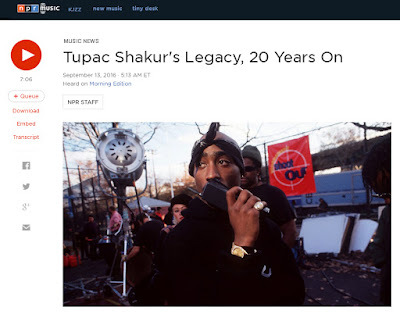 "When we think about Tupac Shakur... not just in hip-hop but popular culture, in America and globally, you have to think about Elvis Presley, James Dean, Marilyn Monroe, John Lennon, Bob Marley," Powell says. "It's that significant. He is one of the most important figures that we've seen in the last 25 years or so."